This is the 5th in the "Dedications" series, with compositions and poems honoring artists and personal friends. This is the fourth in my dedication series for jazz icons, personal friends, places, and moods. This set contains works inspired by my mother, father, and brother, plus compositions for tenor saxophonist Houston Person, Brazilian composer Antonio Carlos Jobim, and the great drummer Elvin Jones of the classic John Coltrane Quartet. I previously recorded an instrumental version of “Circle Dance” on my first CD, "Harlem Sunset," and a vocal version on my second CD, "Music and Lyrics;" there was also a vocal version of “I Never Knew” on "Music and Lyrics." “The Dance Spot” was originally written for the jazz musical "Manhattan Moment"s which I co-wrote and co-produced with choreographer and dancer Kathy Sanson. The musician are Eddie Henderson, Wycliffe Gordon, Bruce Williams, Patience Higgins, Renee Rosnes, Steve Kroon, Peter Washington, and me. 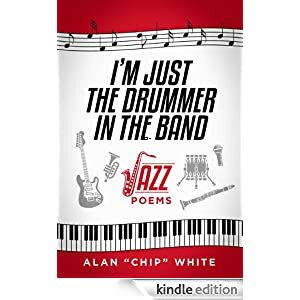 The poems on disc 2, from my book "I’m Just the Drummer in the Band," are tributes to many of the great artists who inspired me to become a musician and composer. This book is now available as an e-book. This is the third in my dedication series for people, places and moods. Most of my music is autobiographical on some level, some more obvious than others. The compositions on my two earlier recordings in this series, "Double Dedication" and "More Dedications" helped me combine the traditions of jazz legends with my own concept of their style, as does "Something about Rollins" on this CD. As with these earlier recordings, my original compositions are on disc 1 and my original poems are on disc 2. The musicians are Randy Brecker, Steve Wilson, Wycliffe Gordon, Patience Higgins, Renee Rosnes, Steve Kroon, Peter Washington, and me. Buy it on CD Baby! 100 poems about jazz musicians, from Jelly Roll Morton to Keith Jarrett, and everybody in between. Itis now available as an e-book!! You can buy it from Kindle, from Barnes & Noble, from Apple's iBookstore; from Kobo, from Sony, from Scribd. Over the next several weeks, it will become available for other e-readers. You can sample some of my poetry on the Poetry tab on this web site. You can read some of the poems by clicking on Poetry. You can buy a printed copy directly from me for $25 + $5 mailing costs. This recording is essentially Volume II and (or) the extension my previous CD, "Double Dedication" with my compositions for nine more jazz artists who inspired me, and a corresponding poem on the second disc. "More Dedications" is a two-disc set. The music is on disc 1 and the poems, with the music in the background, are on disc 2 . The musicians are Steve Nelson (vibes), Wycliffe Gordon (trombone), Duane Eubanks (trumpet, fluegelhorn), Patience Higgins (alto & soprano sax, flute), Mulgrew Miller (piano), Peter Washington (bass), and me. This is a two-disc set with my original compositions honoring 13 famous jazz masters on the first disc and my original poems for the same artists, with the music sequenced underneath, on the second disc. The musicians are Gail Allen, Steve Wilson, Randy Brecker, Wycliffe Gordon, Kenny Barron, and Ray Drummond. My second recording with all my own compositions, lyrics, and arrangements. My first recording, with six of my original compositions, featuring Gary Bartz, Robin Eubanks, Steve Nelson, Claudio Roditi, and Buster Williams. You can buy all my CDs from CD Baby.